“Necessity is the mother of invention”—the proverb goes without saying and stands to reason with all the discoveries and inventions what we see today. One of the important inventions created so far is mobile phones that have become part and parcel in the day-to-day life. Passing a single day without these gadgets make people feel like fish out of water. Mobile phones, therefore, seem a sweeping breakthrough allowing people to interact with one another in a flash no matter what the location of the world is. Witnessing the apparent utility and the importance of mobile phones, the majority of people from all over the world tend to use mobile phones and why not—they are ease of use, hassle free and feasibly help in communicating people with their families, friends and other individuals within a matter of seconds! Apart from establishing communication, mobile phones are also the thing to cater to the varieties of jobs, especially related to the business. Now, one can go through the e-mails anytime and in any situation, maintain the day-to-day agendas, and various other jobs you just cannot think without these gadgets. Mobile devices are therefore the runaway success all over the world. However, if there is any mobile user interface technology that has caught the attention of people to use mobile phones, then it is no other than Mobile Phone Application. In the cutting-edge technological era, you can find varieties of Mobile Phone Applications embedded with varied functions. Mobile phone applications have taken the industry by storm. Heading out from the fundamental calculator, you can find fully sophisticated database programs located on the desktop of your mobile, a browser helping you efficiently to browse the internet and other wide-ranging applications. Mobile application development is an innovation in the market that introduces new avenues and helps in interacting your business, your standpoint and your identification across the target audiences and other people. With the ever-increasing development of mobile technology, mobile application development is sure coming to the front more. Whether it’s a universal game, a function, software or any typical thing, mobile application proves functional in one way or the other. 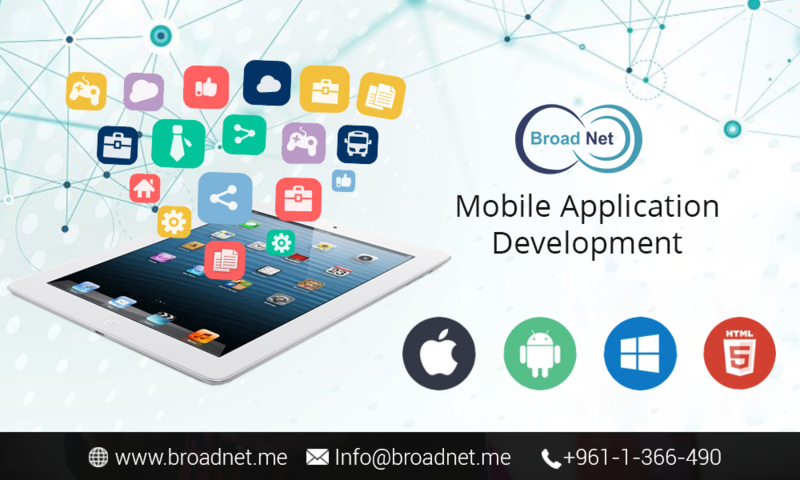 And if you are among the businesses who want to develop the mobile apps with the top-grade results, then BroadNet Technologies is the well-thought-of and premier IT Company you can pin faith on unreservedly. Being a premier mobile application development Lebanon, we have made a record of accomplishment by delivering excellent mobile app development results during the stint of our business. We are the maestro of the mobile app development and keep a tab on the evolving trends of the industry. So when it comes to developing mobile applications with guaranteed satisfaction, we are always at the leading edge of the technology. In fact, we have a team of veteran mobile application development experts who shine at developing first-rate mobile apps that deliver the best performance on all mobile operating systems.